Chip- and mar-resistant finish. Constructed of traditional hardwood. Urethane-coated for long-lasting durability. 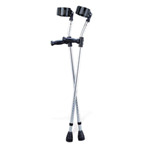 The Invacare 1" Cane Tips fit most canes with 1" diameter. 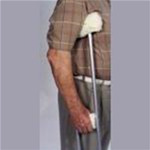 They grip the surface and absorb the shock from using a cane. Cane used for Parkinson patients with a freezing gate. A red laser light breaks the freexing episode and allows for safe unobstructive walking. Derby shaped handle, artistic spiral hand grooved chestnut shaft, 36" long with rubber tip size varies. "Step-Brella" Adjustable cane umbrella. With Grey & Burgundy pattern. Unisex soft touch crook shape handle, set on a black hardwood shaft. 36"
Ladies derby lucite handle: Ruby Pearl, hardwood metallic burgundy high gloss finish shaft with brass ring, rubber tip. Men's derby handle, beech wood, scorched with brass band, 36" long with rubber tip. Unisex "Tuxedo Time" Fritz handle-chrome plated metal on a walnut and cherry stained hardwood shaft, 36" long with rubber tip. 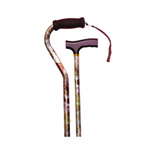 Extra tall aluminum adjustable folding cane with derby handle with water drop finish. Adjusts from 39"-43". Men's crook genuine pigskin handle, 1" diameter with tapered maple shaft, 36" long w/rubber tip. Ladie's Carbon Fiber derby cane with red rose on golden colored folding cane with carrying case and clip. Cane measures 33"-37". Mens derby inlaid handle. This distinguished design is timeless, crafted with the old world tradition of quality and workmanship. 36"
Fritz cane without band/not same as pictured. Limited quantities of a non stock item get them while you can. Ladies derby lucite handle: Pearly blond, hardwood metallic gold high gloss finish shaft with brass ring, rubber tip. Round nose crook handle hospital cane, 1" diameter hardwood shaft, 36" long w/rubber tip. Extra sturdy. Available in five fashion colors with 14k gold plate band. Natural chestnut walking stick, knob handle, with polished natural bark . Thickness of sticks will vary. 36" long w/rubber replacement tip varies. "Blue Jeans" scorched sweet chestnut wood derby handle on high gloss denim blue stained shaft and black chrome ring, long with rubber tip. Available in men's and ladies'. Crook shape black plastic handle brandy bottle cane with five glass flasks. Black anodized aluminum shaft and gold tone band, 36" long. Cane umbrella with blue and black pattern. This unique umbrella has a hidden cane in the center that can be detached to use for walking while having the umbrella to keep you dry. 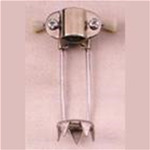 Fits items 5940A, 5941A, 5950A-1, 6015A, 6220A, 6221A, 6327, 6328, 6333A, and GF5 949-1. Fits 3/4 inch tubing. 4-pack.